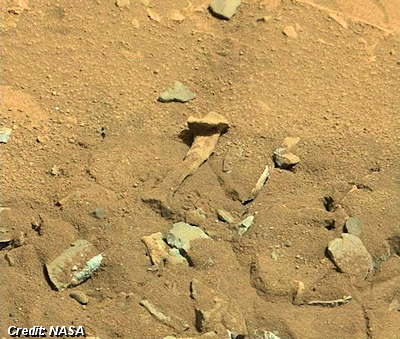 NASA has put an end to claims of many people around the world about a bone-like object on Mars showed by a photo captured by the Curiosity rover and published by NASA. Many conspiracy theories emerged after the photo was posted online, with many saying the object in the picture is a spine or a finger or a human thigh bone. However, NASA soon came into action and refuted all such claims, saying the object is nothing, but has been simply formed by erosion, either wind or water. "If life ever existed on Mars, scientists expect that it would be small simple life forms called microbes. Mars likely never had enough oxygen in its atmosphere and elsewhere to support more complex organisms. Thus, large fossils are not likely", NASA published on its website. . . .